Are you feeling lucky? You should! 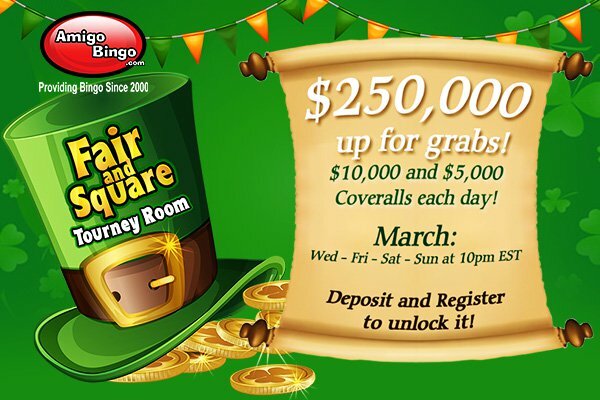 March is here with more chances of winning, bigger jackpots and incredible extra prizes! In the FAIR & SQUARE tourney, every player has exactly the same chance of winning lots and lots of green for the same flat fee. Feel the luck of the Irish every Wednesday, Friday, Saturday & Sunday at 10pm (EST) throughout March and find your very own pot of gold (Exclusive Room). Simply register with $25 cash and you are in it to win it – DEPOSIT AND REGISTER to unlock this room. The $25 CASH fee covers the automatic pre-bought cards for all games, including the $10,000 CA, $5,000 CA, and $1,000 CA followed by $100-$500 multipart GUARANTEED GAMES such as the rainbow, beer, leprechaun, gold coins, treasure, hat and much more… (Fair and Square/12 cards per game). Ok roomies, let’s get shamrocked and bingo! Grab your rabbit's foot, a lucky penny and any other lucky charm that you can find for your chance to become a winner, REGISTER NOW! You must be registered by 1pm each nightly event! This entry was posted in Blog on Mar 7, 2018 by Amigo Bingo.